I have two parrots but lately my life is gotten busy to the point where I’m rarely home and if i am home it’s either to work or sleep before I have to leave again. This leaves both of my parrots stuck i their cages for days at a time with only an hour or so out in the morning or before bed a few times a week. I feel horrible about this and I’m now considering rehoming them. I am extremely particular about who I’d let them go to, to the point that giving them back to the store or giving them to a rescue makes me feel somewhat cautious. I’m not sure what to do. I’m sure things will slow down but I’m not sure when and I feel bad to keep making them suffer. I’m not sure what to do and any feedback would be so appreciated..
And -VERY IMPORTANT!- do a home inspection! Because people lie through their teeth and you need to make sure that they will end up in a good, clean home. I strongly agree with all Pajarita wrote. 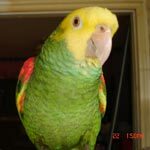 Parrots are lifetime companions, to owners they are much more than just ordinary pets. The decision you have to make won't be an easy one, but you need to double-check every detail, form potential owner's experience and knowledge on birds, to his home. I don't know have you considered a bird sitter as an option? Perhaps you could try that before rehoming them, that way both you and the birds will be less traumatized. If it turns out to be a good option, even better, you can keep the birds but still have them properly taken care of! I have rehomed a few animals over the years. I don't give them up unless they can have a better life than I was giving them. My birds find their own ways to enjoy their days without me even though I am here.